Well, we started this blog with the best of intentions. Unfortunately, it's been a year since we updated. We'll try harder this year, but Summer goes so fast it was snowing before we knew it. Anyway, 2008 looks to be as exciting as ever at Greenbush Golf Course. And if you haven't played yet, you're in for a few surprises. 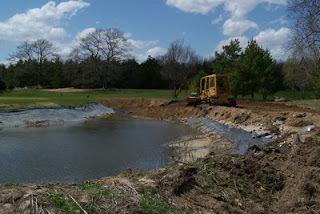 A couple of weeks ago we started the first phase of a rather extensive project—fixing the pond on Hold #6. Over the years, the liner in the pond deteriorated beyond repair. Last year we tried fixing the holes by hiring a crew to clue new liner to the old. As you may have noticed, this didn't work. 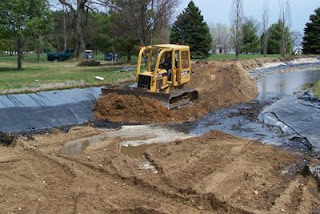 As the pictures show, we brought in a bulldozer to knock down the berms that surrounded the pond. 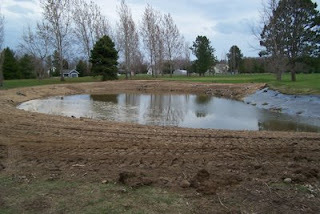 In the end this creates a smaller, shallower pond that will ultimately be more manageable. We hope to spend the summer fixing the pond so it looks as pleasing as it did before the water began to drain.